A statue of Harriet Tubman awaits company at the Harriet Tubman Underground Railroad National Historical Park in Cambridge, Md. The National Museum of African American History and Culture sits on the National Mall in Washington, DC, just down the hill from the Washington Monument. Visitors look over some of the history exhibits at the National Museum of African American History and Culture. An indoor waterfalls provides a contemplative spot inside the National Museum of African American History and Culture. The exhibit tells one story involving some of the people owned by the Ogle family, masters of Belair. During the War of 1812, while the British occupied Washington, DC, they proclaimed all enslaved Africans who came over to the British side would be granted their freedom. About 40 slaves working on Ogle properties slipped away in the dark of night and rendezvoused with a British ship moored off Diggs Point on the Chesapeake Bay. We don’t know what happened to them after that, but none were ever recaptured. 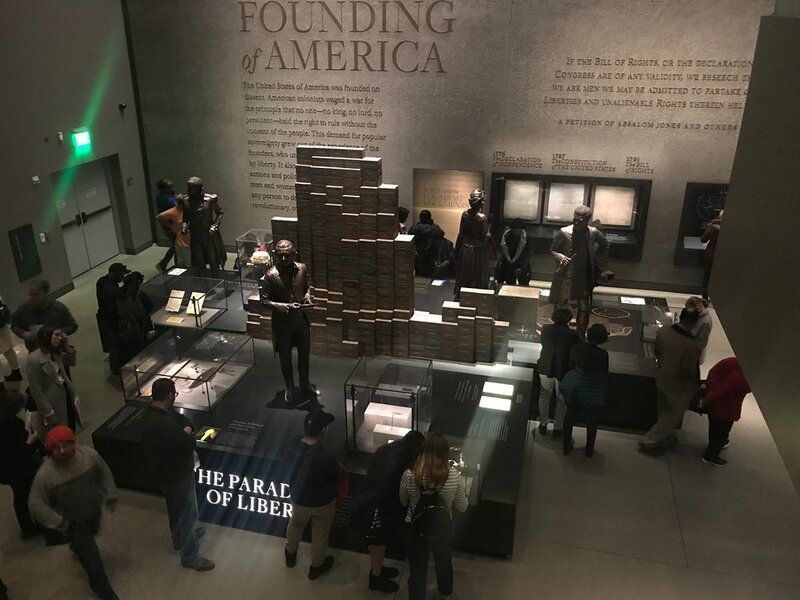 Their stories are among the hundreds told in the Smithsonian’s newest museum, the National Museum of African American History and Culture. More than 4.5 million have visited the handsome building at the foot of the Washington Monument since it opened two years ago. Tickets are free ­– thanks, Smithsonian – but you’ve got to book them months in advance or get up early to grab an online pass the day of your visit. It’s worth the effort. The museum covers 500 years of history with broad brushstrokes and revealing details. A floor devoted to African American culture – art, theater, cuisine and especially music – is as thrilling as the history is sobering. Not only does the museum tell stories from America’s past, it provides booths in which visitors can record their own stories, which are added to the museum’s collection.